Cleans, nourishes and comforts the skin. 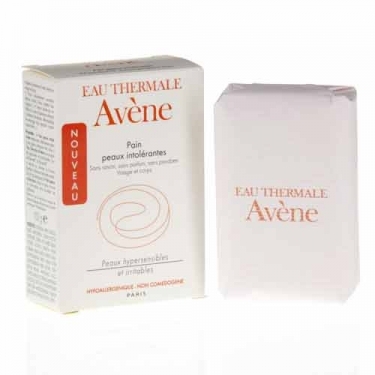 DESCRIPTION: Pain Peaux Intolérantes from Avène is a face and body soap for hypersensitive or intolerant skin (fair skin, thin or prone to redness) and irritated skin (weather aggression, inadequate cosmetic procedures). Its high tolerance formula with physiological pH, without soap, fragrance or parabens, gently cleanses and rebuilds the hydrolipidic layer of the skin. The combination of sweet almond oil, shea butter and parcérine complex comforts and nourishes in depth. Hypoallergenic and non-comedogenic. Apply in the bath, on wet skin, to make foam. Rinse.